Unfortunately the original Omni Pots, those square conductive-plastic potis with the push-pull switch that Schecter used in the Van Nuys era, are no longer available. These were made by Allen Bradley – who are out of business for a long time – or by Bourns who also dropped these from their product range. The only alternative are standard push-pull potis. You can get these here in my online shop, also from Bourns by the way. Generally, the original Schecter wiring is like the standard Tele wiring – with exception of some different component values and the Omni Pots that were required to switch the tapped pickups between their normal and the fatter sound. The potis had a 500k value, something that seems a bit unusual for a Tele (Fender first had 250k and later 1 M). 500k seems to be a good compromise for both the normal and the full coil of the tapped pickups. The tone cap was a 0.02 uF ( sometimes also 0.025 uF or 0.01uF) ceramic disk cap. This value is much smaller than the Fender standard (0.05 uF). Schecter used a 680 pF treble bleed cap with a 150k resistor in parallel on the volume poti (Fender standard: 0.001 uF = 1000 pF and no resistor). The resistor changes the taper of the poti. 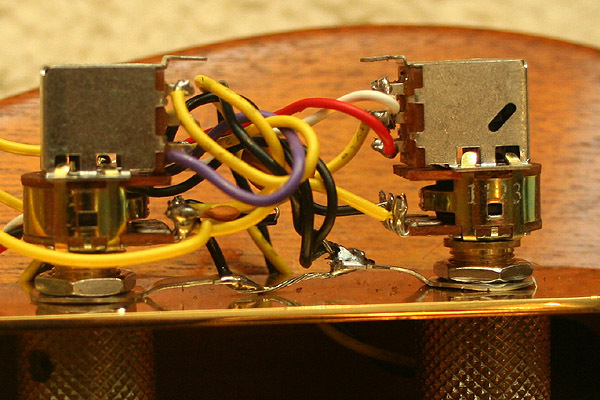 One problem is that normally all ground wires of a Fender Telecaster are soldered on the back of the potis. This was not possible with the Omni Pots as these had a plastic case, and is neither ideal with a standard push-pull poti. Schecters solution was to use a small brass soldering plate that was hold by the two potis. All ground wires were soldered to one point on this plate then. As an alternative to cutting such a plate from a metal foil, you can use two washers with ground lugs, and connect all ground wires to these instead (see photo below). Operation is like on any Tele, with exception of the push-pull potis. Pulling out the VOL poti enables a beefier sound on the neck pickup, while pulling out the TONE poti does the same trick for the bridge pickup. This way you can get 8 different sounds of the two pickups instead of 3 sounds on Fenders (n, b, n+b, N, B, N+B, N+b, n+B, with small letters for the normal and capitals for the fatter sound). The following picture shows how you can use two washers with soldering lugs (included with my push-pull potis) instead of the brass ground plate that Schecter used. Cant wait to hear this wonder. Nice solder pic. Lot of work to do this. I have a custom telecaster inspired on the ‘WLife tele’ but only on the colors. My tele has a Hb at neck and vintage 3 saddles bridge. But the color is identical. Barnes & Noble have a book called “the Illustrated Directory of Guitars” Edited by Ray Bonds. It is a smaller version of another book by the same title. My copy has a jazzbox and a superstrat on the front. 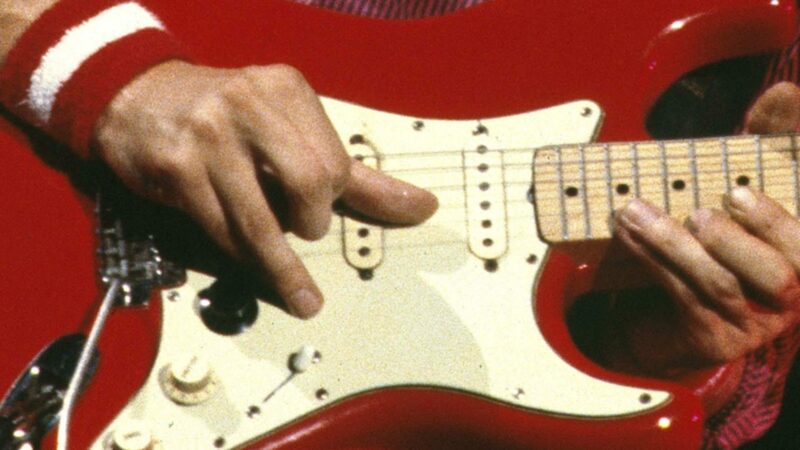 Anyways, in it are close up pictures of a lot of Mark Knopfler’s guitars. His repainted rosewood fingerboard ’61 Strat with the cracked pickguard; the Jurassic strat; his ’58 Les Paul and The Walk of Life Telecaster. Now, throughout the book are also examples of the many reds Fender has used: candy-apple red; fiesta red; torch red; and dakota red. To me, it looks like the Walk of Life Tele is Fiesta. I’ve reached this conclusion by comparing it to a factory custom Tele in the same book, which was painted in fiesta red. I assume that since they probably used the same photographer throughout, the colors are true to each other, even if they are not true to life.